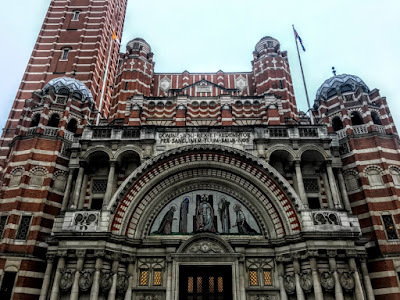 Before I left London for Lichfield after a two-day residential meeting of USPG trustees, I stopped for a while on Thursday afternoon to visit Westminster Cathedral, the largest Roman Catholic church in England and Wales. I had been in Westminster Cathedral once 40 years ago in 1978 for a conference in the crypt organised by the Campaign Against the Arms Trade, and since then had often passed by but had not been inside as a visitor. The site was originally Tothill Fields, a marsh area reclaimed by the Benedictine monks of Westminster Abbey. The Abbot of Westminster held a weekly market and annual fairs here from the late 13th century. After the Reformation, the land was used in turn as a maze, a pleasure garden, a ring for bull-baiting and a burial site after the Great Plague in 1665. In the 17th century, part of the land was sold by Westminster Abbey to build Tothill Fields prison, which was replaced by an enlarged prison complex in 1834. 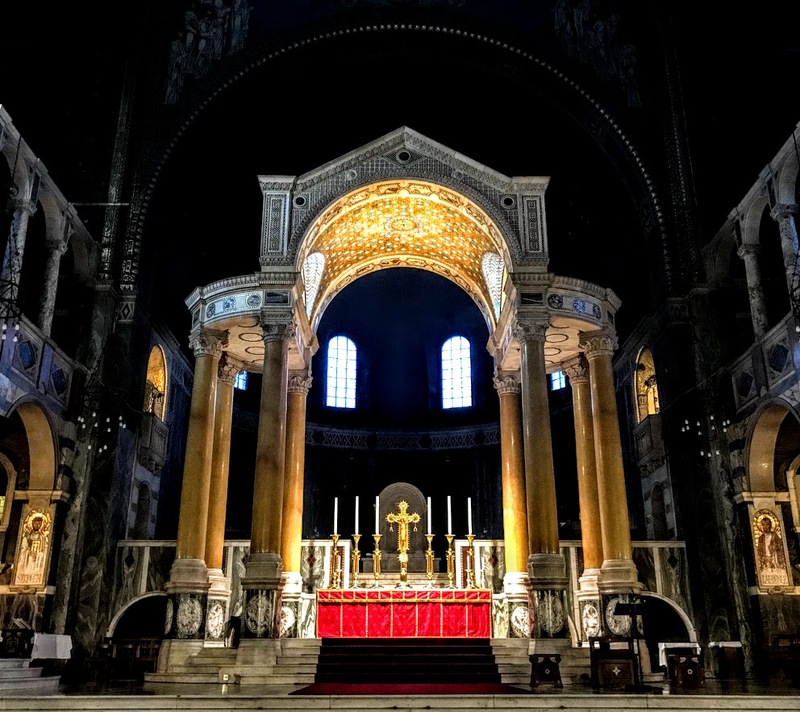 The first large sum of money raised for building a new cathedral was raised in memory of Cardinal Nicholas Wiseman (1802-1865), the first Archbishop of Westminster (1850-1865). The site was bought by Wiseman’s successor, Cardinal Henry Manning (1808-1892), in 1884. After two false starts in 1867, under the architect Henry Clutton, and in 1892 with the architect Baron von Herstel, building started in 1895 under Manning’s successor, the third Archbishop of Westminster, Cardinal Herbert Vaughan (1832-1903), with John Francis Bentley (1839-1902) as the architect. Bentley was born in Doncaster on 30 January 1839. A master of the neo-Gothic and Byzantine Revival styles, his great opportunity came when he was commissioned to design Westminster Cathedral in 1894. After deciding on a Byzantine Revival design, he travelled to Italy to study some of the great early Byzantine-influenced cathedrals, including Saint Mark’s Basilica, Venice. Because of illness and an outbreak of cholera in Istanbul, he was unable to complete his tour with a study of the Hagia Sofia. 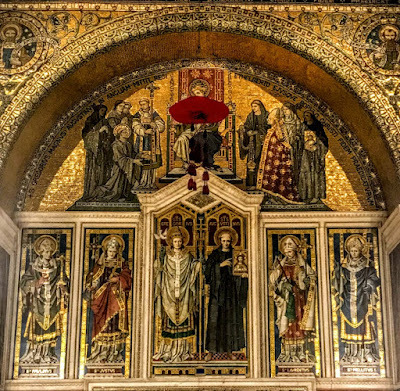 He ended his tour in Venice and returned to London to begin work on Westminster Cathedral. When Bentley died on 2 March 1902, he was buried in the cemetery behind Saint Mary Magdalen’s Church, Mortlake. Nearby are buried Henry Clutton, the architect to whom he had been articled in 1857-1860, and who had made the first designs for a new cathedral for Cardinal Manning. The fabric of the building was completed eight years later. The cathedral opened in 1903, a year after Bentley’s death, and one of the first public services there was the funeral of Cardinal Vaughan, who died on 19 June 1903. For reasons of economy, the decoration of the interior had hardly been started and still much remained to be completed. Under canon law at the time, no church could be consecrated unless free it was from debt and its fabric had been completed. The cathedral was consecrated on 28 June 1910, although the interior was never finished. 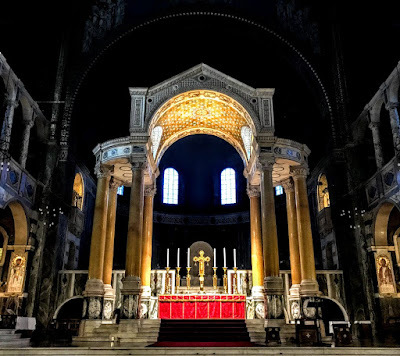 The cathedral has a floor area of about 5,017 square metres, with a campanile, and a spacious and uninterrupted nave, 18 metres wide and 70 metres long from the narthex to the sanctuary steps, covered with domical vaulting. In planning the nave, a system of supports was adopted with huge, yet narrow, buttresses projected at intervals, and stiffened by transverse walls, arcading and vaulting. The main piers and transverse arches that support the domes divide the nave into three bays, each about 395 square metres. The domes rest on the arches at a height of 27 metres above the floor, and the total internal height is 34 metres. The sanctuary is Byzantine in style. 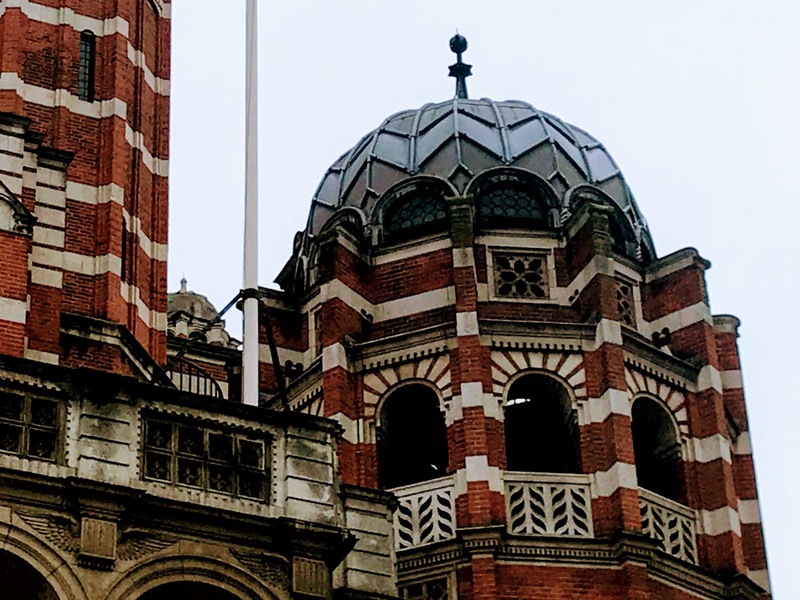 The extensions that open out on all sides make the corona of the dome seem independent of support. The east end of the cathedral suggests the Romanesque and Lombardic styles of Northern Italy. The crypt is inspired by the Basilica of Sant’Ambrogio, Milan. 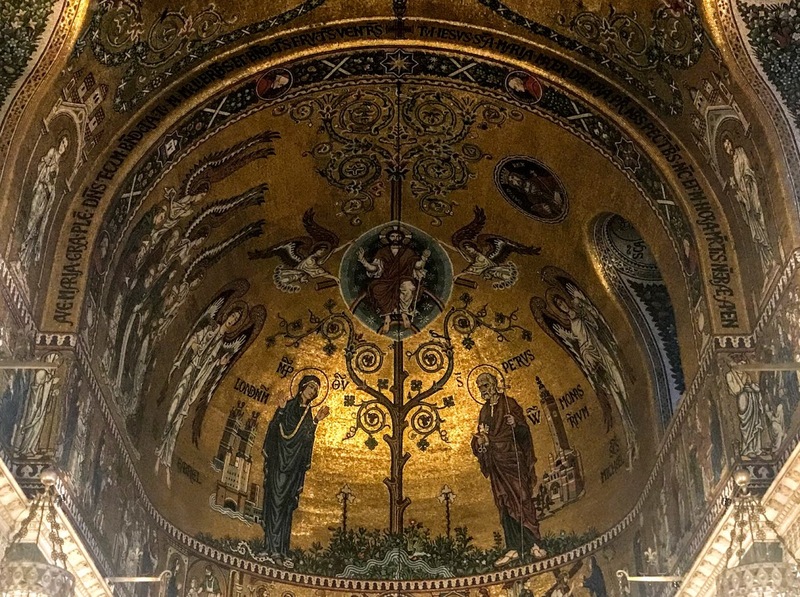 In the Byzantine tradition, the interior was designed with a view to the application of marble and mosaic. Marble columns, with Byzantine-style capitals, support the galleries and other parts of the cathedral. Some of the marble for the columns was quarried in Greece. The central feature is the baldacchino over the high altar. This is one of the largest structures of its kind, the total width being 9.5 metres, and the height 11.5 metres. The upper part of white marble is richly inlaid with coloured marbles, lapis lazuli, pearl and gold. Eight columns of yellow marble, from Verona, support the baldacchino, and white and pink marble columns from Norway, support the organ galleries. Behind the baldacchino, the crypt emerges above the floor of the sanctuary. 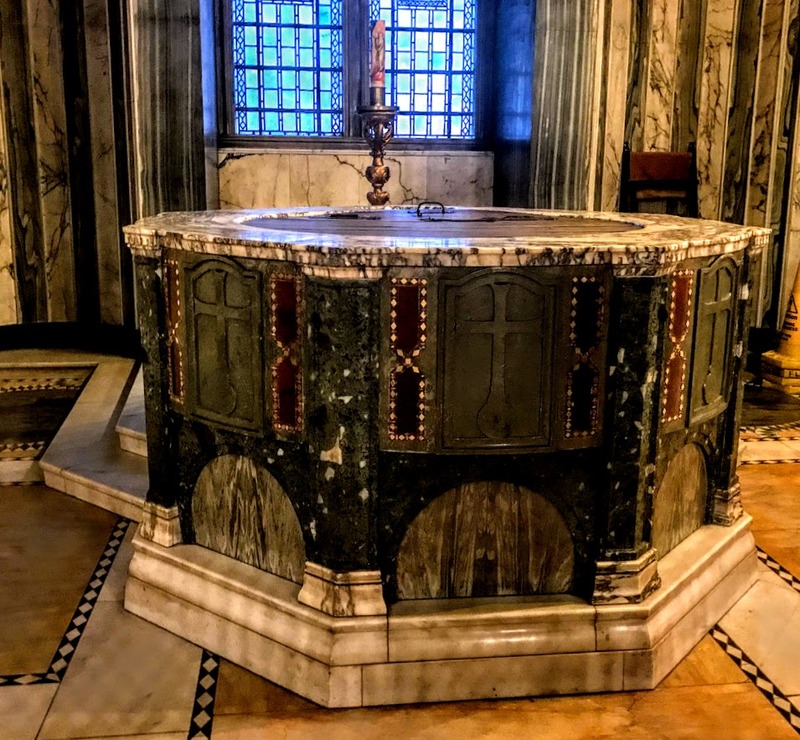 Cardinal Wiseman and Cardinal Manning are buried under the High Altar, and the relics of Saint Edmund of Canterbury are held nearby. When Bentley died, there were no completed mosaics in the cathedral and he left few sketches or designs for his intended mosaics. Instead, the subject and styles of the mosaics were influenced by donors and designers. The mosaics installed in 1912-1916 were mostly the work of members of the Arts and Crafts Movement. Those in the Lady Chapel were installed by Gertrude Martin, who had worked with George Bridge, in 1912-1913. The chapel of Saint Thomas of Canterbury, entered from the north transept, is a chantry for Cardinal Vaughan. In the Blessed Sacrament chapel, a small baldacchino is suspended over the altar from the vault, and the chapel is enclosed with bronze grilles and gates. 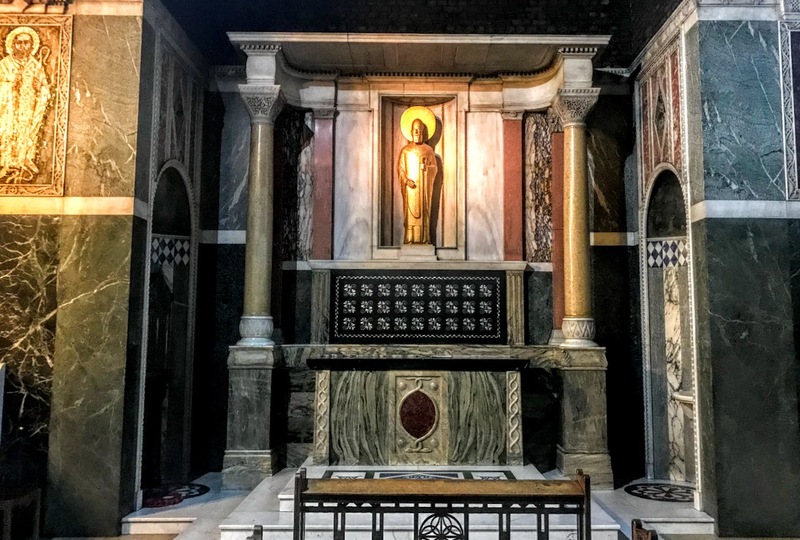 In the Lady Chapel the walls are clad in marble and the altar reredos has a mosaic of the Virgin Mary and the Christ Child. The conches of the chapel contain mosaics of the Old Testament prophets Daniel, Isaiah, Jeremiah and Ezekiel. The chapel of Saint Gregory and Saint Augustine was the first to have its decoration completed. The Chapel of the Holy Souls has a more subdued, almost funereal style of decoration. 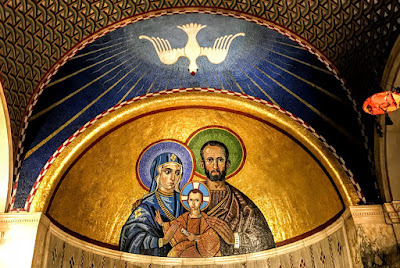 Above the Altar, a mosaic depicts the Archangel Raphael escorting the holy souls through the cleansing flames and the Archangel Michael escorting them out and up to Paradise. 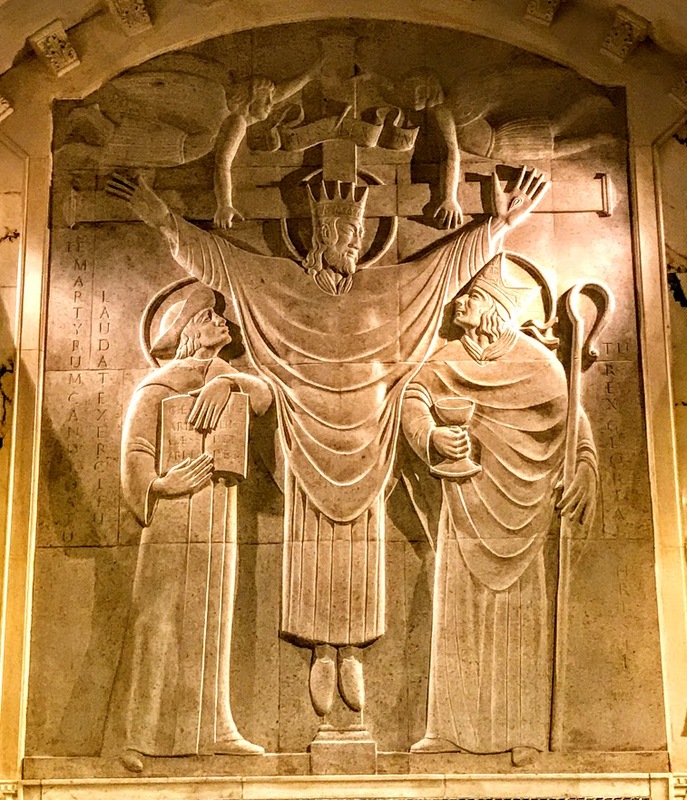 Below, Christ displays his wounds, a reference to the Cathedral’s dedication to the Precious Blood of Christ. There are other references in this chapel to the first performance of The Dream of Gerontius, Cardinal Newman’s poem to a setting by Edward Elgar, in 1903. 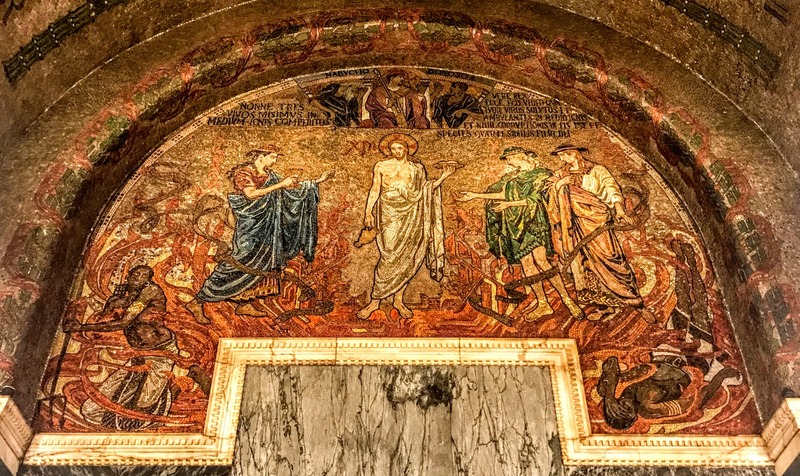 On the facing, west wall in this chapel, the mosaic depicts Shadrach, Meshach and Abednego being cast into the Burning Furnace by King Nebuchadnezzar, as told in the Book of Daniel, but protected by the Son of Man. 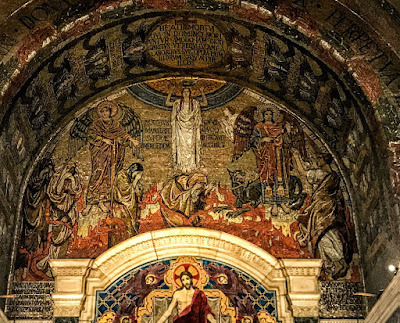 The mosaics in the chapel of Saint Andrew also belong to work of the Arts and Craft Movement. 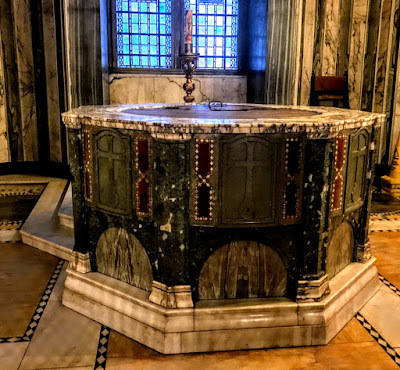 Mosaics were placed in the Lady Chapel in 1930-1935 in the alcoves above the confessionals, in the crypt dedicated to Saint Peter as well as on the sanctuary arch. 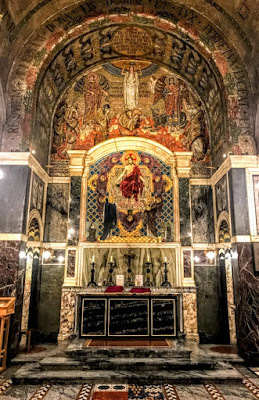 No new mosaics were installed until 1950 when one depicting Saint Thérèse of Lisieux, later replaced by a bronze, was placed in the south transept and another in memory of members of the Royal Army Medical Corps who died in World War II in the Chapel of Saint George and the English Martyrs in 1952. 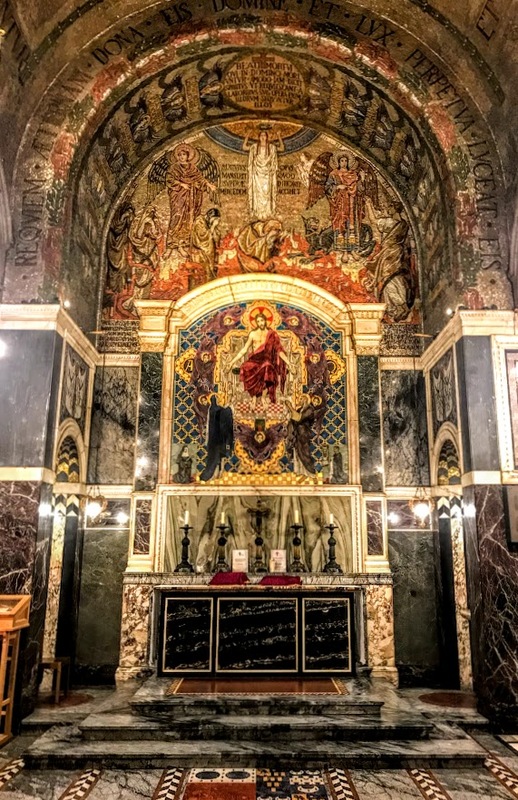 The Blessed Sacrament Chapel was decorated in 1960-1962 in a traditional, early Christian style, with the mosaics being predominantly pale pink in order to afford a sense of light and space. The designer, Boris Anrep, known in Ireland for his decorations of the Cathedral of Christ the King in Mullingar, Co Westmeath, chose Eucharistic themes, including the Sacrifice of Abel, the Hospitality of Abraham, the Gathering of Manna in the Wilderness, the Feeding of the Multitude and the Wedding at Cana. 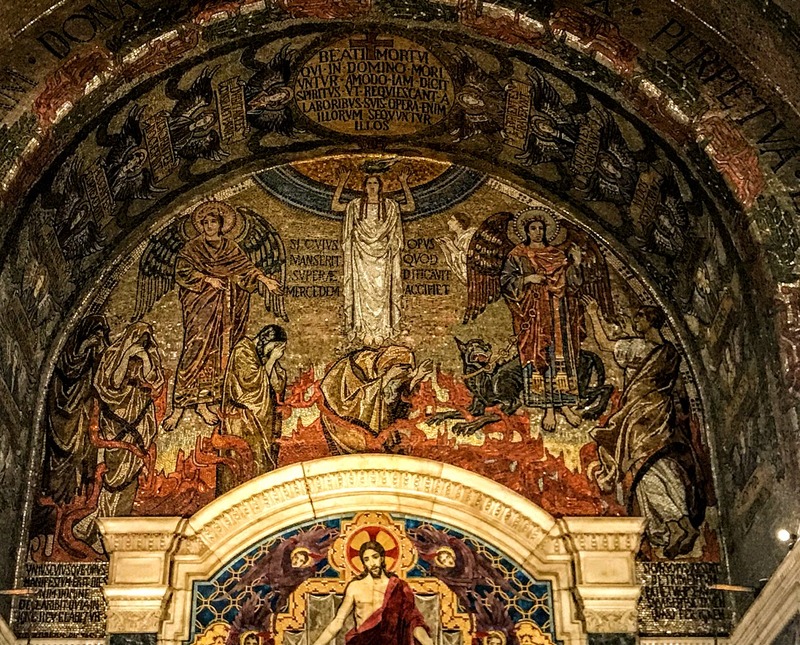 In his old age, Anrep also acted as adviser and principal sketch artist for the mosaics in the chapel of Saint Paul (1964-1965). These mosaics depict events in the life of Saint Paul. The mosaic of Saint Patrick, holding a shamrock and a pastoral staff and trampling on a snake, was installed at the entrance to Saint Patrick’s Chapel in 1999. 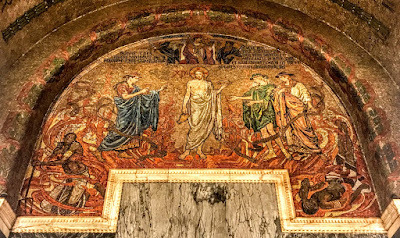 In 2001, a mosaic of Saint Alban, strongly influenced by the style of early Byzantine iconography, was installed by Christopher Hobbs. 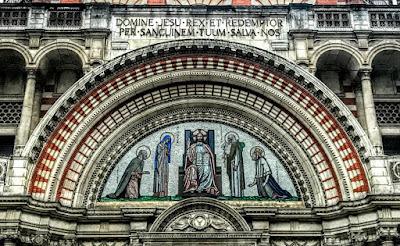 Hobbs was then commissioned for further mosaics: the Chapel of Saint Joseph with mosaics of the Holy Family (2003) and men working on Westminster Cathedral (2006). Hobbs also decorated the Chapel of Saint Thomas Becket with the saint standing in front of the old Canterbury Cathedral and the murder of Saint Thomas. The Stations of the Cross and the carving of the Crucifixion in the Chapel of Saint George and the English Martyrs are by the sculptor Eric Gill, and are among the finest examples of his work. Eric Gill’s Crucifixion above the Altar in the Chapel of Saint George and the English Martyrs is the last work by the great English sculptor, who died in 1940. It shows Christ not as a victim but gloriously triumphant over death. On the left stands Saint Thomas More, Lord Chancellor of England, and on the right Saint John Fisher, Bishop of Rochester, both executed on the orders of King Henry VIII in 1535. Outside, the white stone bands in the red brickwork are striking in appearance. The bricks were hand-moulded by Thomas Lawrence Brickworks in Bracknell. The deeply recessed arch over the main, central entrance, is flanked by tribunes and stairway turrets. 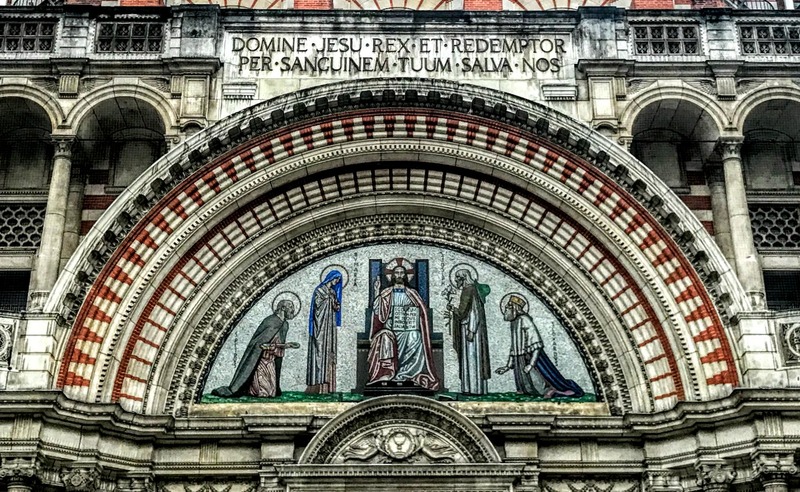 The tympanum of the portal shows in a Byzantine-style mosaic (from left to right), Saint Peter kneeling with the Keys of Heaven, the Virgin Mary, Christ as the enthroned Pantocrator, Saint Joseph holding a lily, and King Edward the Confessor kneeling in royal regalia. 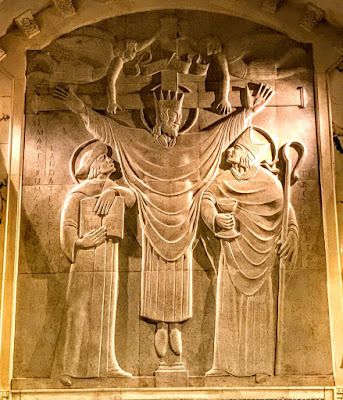 Christ blesses the world with his right hand, and in his left hand holds the Book of Life, with the Latin inscription: Ego sum ostium per me si quis introierit salvabitur, ‘I am the gate; whoever enters through me will be saved’ (John 10: 9). 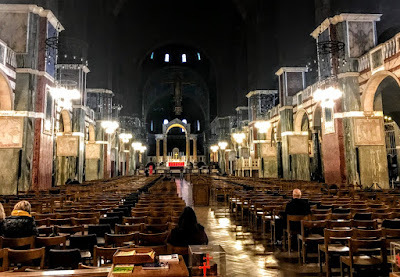 Westminster Cathedral has a distinguished choral tradition. 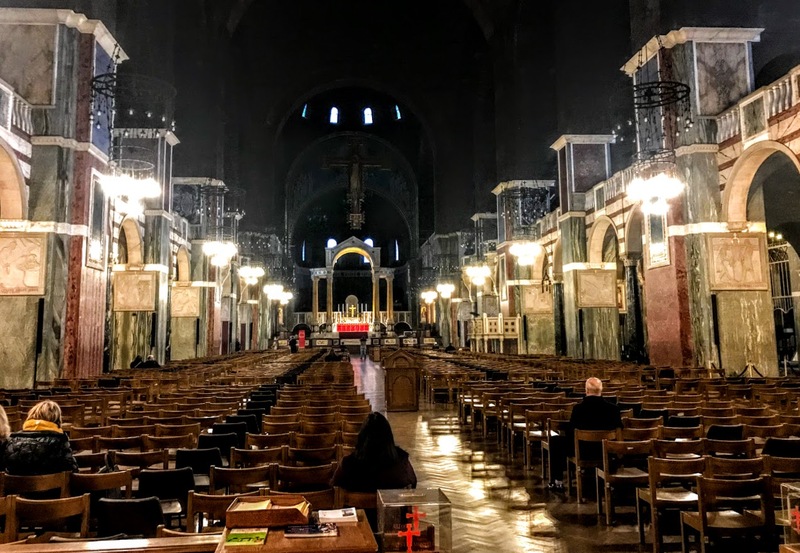 It has its origin in the shared vision of Cardinal Vaughan, the cathedral’s founder, and Sir Richard Runciman Terry, its first Master of Music. The choir has commissioned many works from distinguished composers, including Benjamin Britten and Ralph Vaughan Williams. The Grand Organ, with four manuals and 81 stops, was built by Henry Willis III (1922-1932). One of Louis Vierne’s best-known organ pieces, Carillon de Westminster, the final movement from Suite no 3 (op 54) of Pièces de Fantaisie, was composed for this organ and dedicated to the builder. The apse organ of 15 stops was built in 1910 by Lewis & Co. 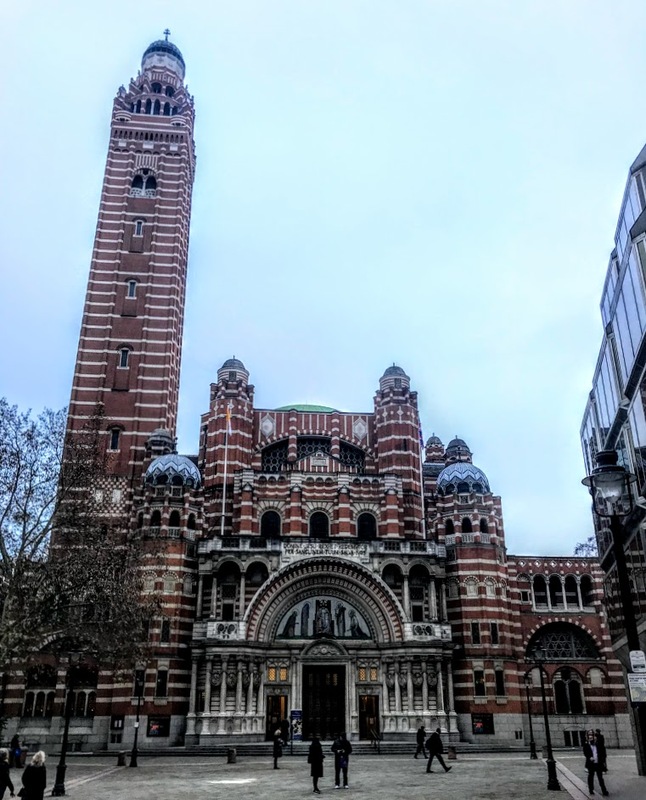 The first performance in London of The Dream of Gerontius, a poem by Cardinal John Henry Newman set to music by Edward Elgar, took place in the cathedral in 1903. John Tavener’s The Beautiful Names, a setting of the 99 names of Allah in the Qur’an, had its première in the cathedral in 2007. During her Silver Jubilee, Queen Elizabeth II visited the cathedral in 1977. She again visited the cathedral again in 1995 when she attended Choral Vespers. Pope John Paul II celebrated Mass in the cathedral in 1982, and Pope Benedict XVI celebrated Mass there in 2010. The Feast of the Dedication of the cathedral is celebrated on 1 July, which from 1849 until 1969 was the feast of the Most Precious Blood of Our Lord Jesus Christ. One of our grandsons is an altar boy there. I visited last February.